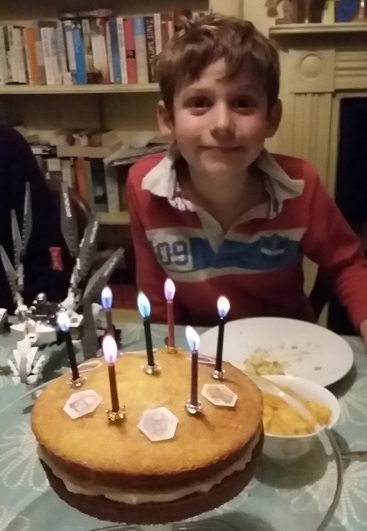 Happiness is…Lego and cake. Apparently. Wow. What just happened to last week? One day we were celebrating a certain seven-year-old’s birthday, and next thing I blink and it’s over. It’s been a post birthday whirlwind of swimming, Cubs, Brownies, Beavers (yes all three right now), a carol concert and a quick chat on BBC Radio Suffolk about Cyber Monday. On the work front, I’ve also been writing a lot about credit. Credit reports, credit cards, credit card interest, picking the right card…I am now ‘credited’ up to the hilt. Blogging? Not so much. I miss it. The stormtrooper, Chewbacca and Yoda were equally delicious. After consultation and much discussion, my son requested lemon drizzle cake for his birthday, with cream – but not jam – inside. This was a great relief, due to my lack of icing skills. I was able to bash out our family favourite lemon drizzle cake in two tins rather than a traybake, bung some whipped cream in the middle, and add some Star Wars edible icing pictures. 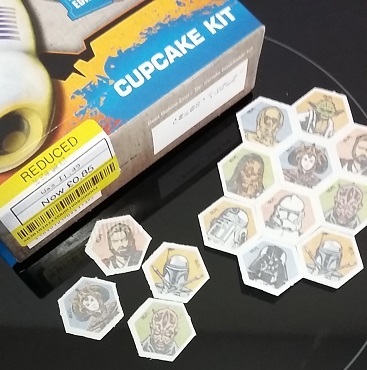 Handily, I spotted a Star Wars cup cake kit on the reduced shelf at the Co-op, so I bought that for 85p and used the decorations. In a fit of extravagance I also lashed out on some £3 birthday cake candles from Tiger with (get this) coloured flames. So that was nice. Aside from presents and a birthday tea, we celebrated by taking George and a friend for a trip to a trampoline centre. I did do a quick search for a voucher, to no avail, so it was great fun but not remotely frugal! Another quick trip to London, and another chance to use my railcard. My Network Railcard costs £30 a year, and means I get a third off off-peak train tickets. 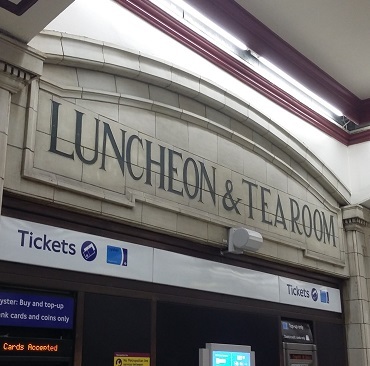 By arranging meetings in the afternoon, I can avoid the peak commuter crush, and pay distinctly less for train travel. On Wednesday for example, my off-peak day return cost £23.55 with the railcard, less than half the price of a £54.30 ticket if I travelled before 10am. December? Must be chocolate for breakfast. Rarely have my children got downstairs for breakfast as quickly as on Thursday. Turns out the appeal of opening the first day of an Advent calendar is a pretty strong incentive. 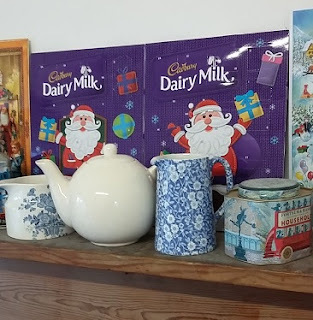 £3 for two Cadbury’s chocolate Advent calendars was money well spent in my book! Amazing – supermarket vouchers for food I actually buy, and amounts I actually spend! Somewhat to my surprise, I’ve started being presented with useful money off vouchers at the Morrisons till. 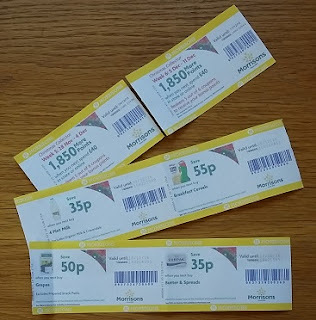 The Sainsbury’s checkout seems to spit out vouchers that offer 50p off strange branded products (don’t buy them), enormous quantities of cleaning products (would help if I did more of it) or money off massive supermarket spending. However, the last couple of times I’ve been to Morrisons, I’ve been given vouchers valid for own-brand stuff I do actually buy – salad ingredients, packed meat, fruit, cheese, milk, butter, cereal and so on. £3.35 in assorted money off vouchers for food I’d buy anyway. £1.85 worth of loyalty points for the Morrison’s More card, by spending over £40 and using one of the weekly Christmas Collector vouchers. On the basis that every little counts, I’ll happily claim that £7.20. Yup, I’m stumped for ways to convey “1,000 Nectar points” in an arresting image. Last week I boosted the value of my Nectar points in a Double Up promotion, and came away with £60-worth of presents including Lego for the birthday boy. This week it was a pleasant surprise to get an email from Nectar offering 1,000 bonus points “to say thanks for doubling up”. The points are worth £5, or twice that in with similar promotions, so will come in handy in future. Any frugal successes to report this week? I’d love to hear! I still need to get myself sorted out for the remaining birthdays and Christmas, so could do with some thrifty motivation. I’m joining in with the #5frugalthings blog linky. If you’d like to join, or just want to check out other thrifty suggestions, hop on over to visit Cass at Diary of a Frugal Family, Becky at Family Budgeting and Emma at Emma’s Savvy Savings. I got to Sainsburys today for the first time in ages. They have the Tate & Lyle's breakfast bottle of golden syrup on offer reduced from £1.75 to £1.25 less 85p cashback from Quidco = 40p. And I got the Mr Kipling mince pies at £1.50 with £1.75 cashback from Quidco. They also had yellow stickered puff pastry mince pies = happy husband. This was a good shopping expedition! Hi Jo – Glad you had such a successful time with Quidco and yellow stickers! All the savings really can add up to cut food costs.